Cymbidiums are said to be the exception to the rule when it comes to orchid care. Among the types of orchids, this is one that can grow freely outside the confinement of greenhouses and similar structures. In fact, because it thrives so well outdoors, it has been a favorite garden plant. It is not “choosy” in soil, temperature and humidity requirements. Cymbidiums are one of the most enduring types of orchids when it comes to temperature. They have been observed growing in temperatures ranging from as low as 18°F to as high as 110°F, for a certain limited period of time. These species of orchids are best grown outdoors because they can survive virtually any temperature change. During harsh winters these orchids should be transferred inside if you wish to have them live through the season. Although they could stand the extreme cold for a combined total of two weeks, it could still mean death to them if left outside unattended. If you want to make sure that your cymbidiums will bloom and thrive then leave them alone in a place where the temperature is between 20° to 40°. Although there are certain parts Florida that these plants refuse to bloom because apparently the night air is a little hotter than they would like it. Other than that, cymbidiums are the perfect flowers for places with varying temperature. 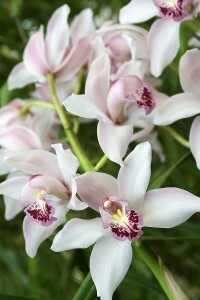 Since cymbidiums are mostly the outdoor type of orchids, they require a lot of sunlight. During summer they can be exposed to direct sunlight and still survive. Remember though, anything that is too much can cause death to any plant, as is the case with these orchids. The perfect setting for cymbidiums is under the shade of a larger tree where the sunlight is filtered by the leaves and the shade. If you cannot find a place like this, anything that can provide sufficient shade for them during the harsh summer is fine. During winter, these plants need sunlight more than ever so whenever you can, find a spot for them where they can sulk in the light for hours at a time. Although cymbidiums can grow in almost any kind of soil, these type of orchids seems to thrive best in leafmold. Mix equal parts of leafmold and leafsoil together with a little bit gravel and you have the perfect soil mixture for cymbidiums. An important part and sometimes one of the things that growers forget when cultivating these orchids is the drainage. In their natural habitats, cymbidiums are found to grow in places where there is proper and adequate drainage, so you must recreate this when they are cultivated. A suggested way to do this is by planting them in raised beds, six to twelve inches above the ground. This will ensure that the excess water will naturally exit the soil. Some orchid growers even place a bedrock at the bottom of their plants then fill it with compost to act as a drainage system. Aside from providing adequate drainage, placing a bedrock beneath the soil will also help your cymbidiums with moisture management. Bury them under the ground with less than half of the rock showing. This will make sure that during the summer their root systems stay cool and in winter will keep them warm enough by removing excess water. When it comes to plant food and these types of orchids, the jury is still out. Most orchid growers who use fertilizers say that feeding cymbidiums do wonders for it. Now the only thing that you must be careful not to do is to let the fertilizer touch its pseudobulbs. This is detrimental because once this happens they will most likely burn and rot. You can use either liquid fertilizers or ground manure. Just remember not to overdo it. Twice a year for ground manure and every three months for liquid fertilizer will be enough to provide the nutrients they need. Cymbidiums compared to other types of orchids need less water. Since the majority prefers to grow them outdoors, they are okay with a watering once or twice every month even in the summer. And during winter, you can even forget about watering them because the regular rainfall takes care of that for you. If you grow them indoors, then you will need to make up for the rainfall that’s not occurring. During spring and summer, keep the potting mix evenly moistened regularly. You can water less in the late summer, and barely at all in the winter – keeping it barely moist (much like when you grow them outside). When you water them, let the water run through to wet the mix thoroughly. Then let it drain completely. During winter, where extremely low temperatures are unavoidable, you may want to transfer your cymbidiums into pots. Or if you have chosen to grow them indoors, the task of choosing a container for these types of orchids is equally important. The perfect pots for cymbidiums are those that can provide proper drainage. Keep them away from shallow pots and fern pans. These containers can easily heat up and can dry the roots. Deep clay pots with a layer of rocks at the bottom are preferable for they are cooler and provide adequate drainage. Choosing a medium for cymbidiums is fairly easy. As previously said they practically thrive in any kind of soil. But two favorites are osmunda and leafmold. But if you prefer another soil mixture, it will be okay. The only medium known not to support cymbidiums is gravel, as long as you stay away from that, you are fine. Lastly and maybe one of the most crucial steps to growing healthy cymbidiums is repotting. Because cymbidiums have very delicate root systems they do not respond well to repotting. They are said to suffer shock easily. When repotting, make sure that the roots stay intact or else you would not see them bloom for a year or two. Some growers even wait two to three years before attempting such a task. No matter where you decide to grow them, inside or outdoors, cymbidiums are very gracious plants when it comes to flowers. So be sure to keep these essentials in mind. And if you are looking for the least needy plants of all the types of orchids, then cymbidiums are the answer for you. Thanx…real great, simple to understand/use advice! Being a Nursery Manager (at the Potters Yard Nursery) in Hout Bay, Cape Town, S.Africa, I get a lot of queries from clients who buy Orchids, but do not know how to care for them…and this is especially where yar info is invaluable to me, since I’m still learning about Orchid care. etc…myself! do you ever cut the leaves on a cybidium? it survived the colder winter we had this year in CA, and it looks good someone suggested cutting the leaves back but I have not seen where to do this in your ten points of growing? Thanks so much. Easy to do. Will cymbidiums re-bloom? How do I make that happen? I have many Cymbid. But I have one that is in a 2 1/2 ft pot. I planted it in there 2 yrs ago. And it hasn`t bloomed. And the other 8 are root bound. If I repot them careful like…will they rebloom? Or should I just wait and see if they bloom. Or should I just repot them and see what happens? I HAVE A FLORIST ,, CAN I GET THE INFO. ON BUYING ORCDIDS? i have recently acquired a cymbidium orchid plant. it had given a new root that broke accidentally. what happens now? Hi! Thanks for the easy summary of care. I purchased two Cymbidiums at our arboretum sale yesterday and need to know how to care for them. I live in central coastal CA, so I see these growing in gardens – thriving and huge! That’s what I want!! They are blooming now and I want to put them in nicer containers than the plastic pots. Should I wait until they stop blooming? How careful do I need to be with the roots? Are they super delicate? Will they bloom every year? Finally, what do you mean by bedrock? Thanks!! a very helpful information for the one who like orchids. I need to repot quit large plants that have a lot of dead in the center. Can you tell me what to do? Thank you I live in Australia my cybs are not doing so well they are outside and we have had a very wet season any ideas ? Am kizito Paul Uganda east Africa we are in the tropical region ,ive kept cymbidiums for 5 yrs ,i only saw 1 blooming but also dried out before opening , i have over 400 pots.my question is our region good for them because ive done the best advise . any recommendations to get it to flower? also temperature wise ranges from 50 degrees to 72 degrees min/max within the year averaging at 63 degrees year round indoors. Thanks for all the GREAT info and guidance… But I haven’t found any information to a specific question I have. If a bulb blooms, will the same bulb bloom again in the coming seasons/years? Or does it slowly die off while producing new shoots and retaining water for the rest of the pot? I assume they will bloom again based off my experience with other orchids, however… we all know what happens when you assume! Also… Do you know of any good websites to see photographs of flower spikes in their beginning stages? I recall seeing information in past years that helped me distinguish between a Flower Spike and New Growth… But I can’t seem to find it now. Especially when I am taking a flash light to mine patiently waiting, and investigating, the vast amount of new protrusions I’m getting this time of year (in Ohio USA)! Thanks again! Hope to hear back soon! Its good to get back to basics. Thanks for the basics with out all the unnecessary and some times confusing technical data. I have a white cymbidium that is 52years old and has been potted its whole life and blooms every year. Thank you for your very accurate and informative website. My daughter gave me a cymbidum orchids that’s in a small vase with clear stones and water. It looks a stem with a flower in it, but I see small roots on it. I want to make it an indoor plant with my other orchids. I’m no sure when to repost it or let it grow in the water. Please help me with your advice. how to care for cymbidium orchids for them to flower? Gardens how to get it to bloom and he told me that it would never bloom because our winters aren’t cold enough. He told me that I would have to put in the refrigerator every night to get it to bloom and otherwise to throw it away. Is this true? It seems like such a waste. I have over 25 other kinds of orchids that are doing great. I hate to give up on this one. I live in Queensland in Australia and grow cymbidiums. My problem is the tips of the cymbidium leaves are going brown.